acorncentreblog.com: Olivia Ward, Toronto Star....background of Sunni Shia conflict....worth the read! Olivia Ward, Toronto Star....background of Sunni Shia conflict....worth the read! Half of believers in the Middle East and North Africa say religious conflict is a major problem for their countries. How did it come to this? Some answers lie in the distant beginnings of Islam. In the not-so-distant past, the doomsday scenario was a cataclysmic “clash of civilizations” between Muslims and the secular West. But the Arab Spring has brought a seismic shift in the sectarian landscape. With civil war and political chaos rippling through the region, the deadly divide now runs through the Muslim world itself. In Syria, Lebanon, Bahrain and Iraq, Sunni and Shia Muslims are struggling for power while religious intolerance rises violently in Egypt. Meanwhile, the Sunni Gulf States are fighting proxy battles with Shia Iran for supremacy in the region, with Syria as ground zero. In the Middle East and even tranquil Belgium, mosques have been attacked and bombed in acts of sectarian vengeance between Muslims. Worshipers have been wounded and killed. Rival sects revile each other’s faiths and arm militias for escalating battle. Now, some 50 per cent of believers in the Middle East and North Africa say religious conflict is a major problem for their countries, according to a recent Pew Research Center survey of the world’s Muslims. Some answers — but only some — lie in the distant beginnings of Islam. The schism in the faith opened when the Prophet Mohammed died in 632: he left no will or designated male heir. Shiites opted for his cousin and son-in-law, Ali, as his anointed successor. Sunnis believed his friend and father-in-law, Abu Bakr, was a better qualified candidate. Bitterness and bloodshed followed. The seal was set on the sectarian split. Martyrdom and sacrifice ran deep in the Shia faith, along with a sense of injustice. Many Shiites believe that there were 12 Imams, and that the 12th vanished, but would eventually reappear and bring justice to the Earth. While Shiites believe their leaders, the ayatollahs, are representatives of God on Earth, Sunnis focus on the teachings of the Prophet. For centuries the religious practices have diverged, each side accusing the other of heresy or extremism. However, Muslims managed to avoid the massive decades-long battles of Christianity, and have managed, however uneasily, to coexist and intermarry. Outside the Middle East only a minority are concerned with sectarian strife, according to the recent Pew poll. In the Arab countries, that may now be changing. But even before the Arab Spring, the U.S.-led invasion of Iraq touched off an explosion that blew apart the relative calm that had prevailed between the region’s Sunni majority and Shia minority under dictatorial regimes. “The war in Iraq institutionalized sectarianism,” says Baghdad-born Abbas Ali of Indiana University of Pennsylvania. In an effort to re-balance power in a Shia-majority country that had been dominated by Saddam Hussein’s largely Sunni regime, the American occupation stripped power from Sunnis, along with the livelihoods of many who had held bureaucratic and middle-class jobs. The explosion of sectarian violence that followed the invasion polarized Iraq and caused the death of tens of thousands of people in attacks that are ongoing today. But the rise to power of Iraqi Shiites, and their links with co-religionists in Iran, also shifted the geopolitics of the region. 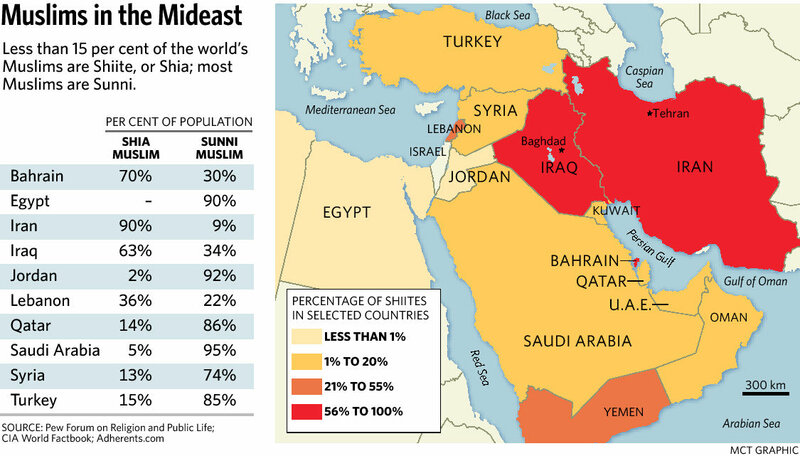 In the Muslim world, Sunnis make up about 80 per cent of believers. Among the Middle East and North Africa’s 315 million Muslims they are a significant majority, except for Iran, Iraq, tiny Bahrain and Lebanon. But in spite of their strength in numbers, Sunnis have feared Iranian-engineered Shia expansionism. Many saw the Shia victory in Iraq as a tipping point. King Abdullah of Jordan first sounded the alarm in the Sunni Middle East by warning of a “Shiite crescent” that would draw in governments and factions from Iran to Iraq, Syria, Lebanon and the Persian Gulf. The volume rose as economic powerhouse Saudi Arabia added its voice to growing fears across the region. Anxiety was boosted by economic as well as religious issues: the struggle for oil transit and markets. But the Arab Spring changed the geopolitical landscape yet again, letting loose old and new hostilities. In Egypt, where close to 90 per cent of the population is Sunni, and Shias a negligible presence, the Christians who make up 5-10 per cent of the population have been savagely attacked and their churches destroyed. But Shias were also assaulted and some killed in mob violence. The war in Syria — with a Shia-linked Alawite regime battling for survival against mainly Sunni rebels — sent out new shocks in the turbulent region. The Syrian civil war, she says, has given the Gulf rulers a reason to repress their own Shia populations, and to detract from the legitimate grievances of opposition members. A dangerous turning point arrived when the leader of the Lebanese Shia faction Hezbollah — backed by Iran — admitted publicly that he was sending fighters to Syria. It is now seen as a defender of Shia Islam in the region, confirming the suspicions of Sunnis who see Iran’s hand everywhere. But Sunni militancy has also been rising alarmingly, as Gulf money backs radical foreign groups who have streamed over the border to Syria.. The most vocal of the Middle Eastern radicals are Salafists, fundamentalist Sunnis who believe in strict adherence to the Prophet’s teachings and habits, and denigrate those who disagree as non-Muslims. They officially oppose violence, but a minority have carried out violent attacks on their religious foes. In Egypt, hardline cleric Mahmoud Shaaban called for the deaths of leading opposition figures. Some members of North African al Qaeda groups are also Salafists. But even the Muslim Brotherhood, a more moderate faction, has hardened its rhetoric. In Qatar, Brotherhood spiritual leader Yusuf al Qaradawi condemned Alawites as “infidels” and called for Sunnis “who have the ability and training to kill” to join the rebels fighting the Assad regime. “Some of the (Sunni) clerics have taken the war inside the mosque and framed it in sectarian terms,” says Abdo. The prospect of radicalization is most worrying in Lebanon. A car bomb recently killed 30 people in Hezbollah’s heartland of southern Beirut. Earlier, a similar attack wounded more than 50 people. There have been deadly gunfights between Alawites and Sunnis in Tripoli. Lebanese people once again live in fear that the devastating civil war that laid waste to the small country for 15 years will return. Syrian spillover seems less perilous in Jordan, whose Sunni majority is almost absolute — though its already divided population is rapidly being overwhelmed by Syrian refugees, including opposition members who could be targets for Syrian revenge. There are also worries that political instability could be contagious. Neighboring Turkey, which has accepted nearly 500,000 Syrian refugees, was torn by protests against its Islamist government. President Recep Tayyip Erdogan’s crackdown opened new wounds. Farther from the conflict, the majority Shia population of Bahrain is struggling for rights under a royalist Sunni government backed by hardline Saudi Arabia. What lies ahead for Muslims in the Arab lands is uncertain. And although religion is only a factor in the struggle for power that surfaced when dictatorships sank, it is one of the most potent. The historic hostilities ratcheted up by dictators and militants to divide the Arab countries may doom the future of the region — as well as its legendary past, which is disappearing into ruins.